When in a hostile environment, obtaining reliable information about upcoming threats ahead of time could mean the difference between life and death. Unmanned aerial vehicles (UAVs), which can travel at high velocities and have a large field of vision, are excellent tools for performing such reconaissance missions. Here at the GRITS Lab, we are designing decentralized algorithms which are scalable for coordinating multiple UAVs to perform ground convoy protection missions. In particular, the UAV team must fly above the ground convoy so as to offer visual coverage of the surrounding area. In the event of pop-up threat, the UAVs must negotiate amongst themselves whom to dispatch to investigate the threat in a way that balances the fuel consumption. In the event that a threat is persistent and cannot be cleared, the dispatched UAV must rejoin the others and signal to the ground convoy that it is necessary to replan the path to avoid the threat. 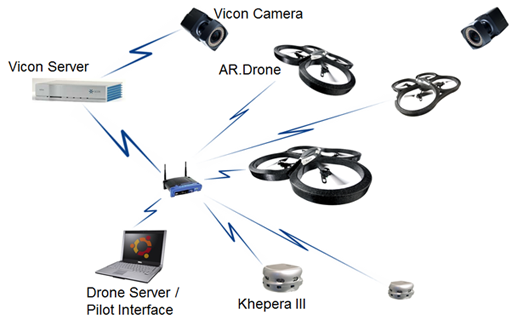 The UAV coordination algorithms developed as a part of this project are also being tested on a hardware platform. In particular, Parrot AR.Drone quadrotors will be used as UAVs, while Khepera III robots will be used as the autonomous ground convoy that needs protection. A Vicon system in the lab provides localization information for each of the unmanned vehicles, and they communicate/coordinate over a wireless network. X.C. Ding, A. Rahmani, and M. Egerstedt. 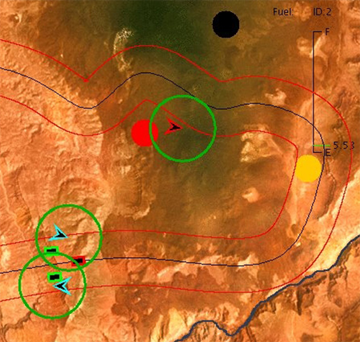 Multi-UAV Convoy Protection: An Optimal Approach to Path Planning and Coordination. IEEE Transactions on Robotics, Vol. 26, No. 2, pp. 256-268, 2010. A. Rahmani, X.C. Ding, and M. Egerstedt. 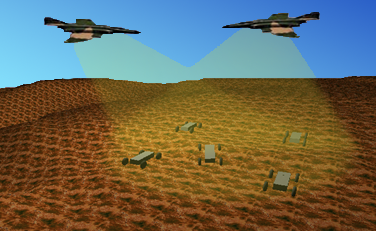 Optimal Motion Primitives for Multi-UAV Convoy Protection. IEEE International Conference on Robotics and Automation, Anchorage, Alaska, May 2010. P. Twu, R. Chipalkatty, J.P. de la Croix, A. Rahmani, M. Egerstedt, and R. Young. A Hardware Testbed for Multi-UAV Collaborative Ground Convoy Protection in Dynamic Environments. AIAA Modeling and Simulation Technologies Conference, Portland, OR, Aug. 2011. To appear.